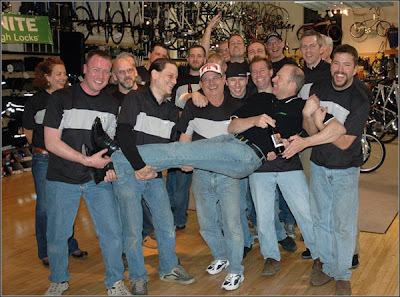 Some of you may remember a high point in the history of Century Cycles, when Bob Roll visited our Rocky River store in March, 2006 (that's him above, being given the old heave ho by the CC staff). He gave us in the inside (and hilarious) scoop on his experiences riding in the Tour de France and now commentating on it. His legacy lives on, in our memories and on the wall of the Rocky River store's bathroom, where he scrawled a personal message to all who feel the call of nature while visiting the store. So the TdF comes down to today's time trial, with a fight to the finish between Cadel Evans, Carlos Sastre, and the other top GC contenders. Bobke says Cadel Evans has been "incredibly fragile emotionally," an opinion seconded by Paul Sherwen, who writes on his Versus blog: "Sastre has looked good and calm since he took the overall lead while Evans has been nervous and twitchy." And how 'bout those Schleck brothers?! They and others have made it a fun TdF to watch this year, especially with a DVR to fast-forward through all those Saab commercials.